As an orthopedic surgeon with a specialization in hand, wrist and upper extremity conditions I often see patients who suffer from repetitive stress injuries including carpal tunnel syndrome, trigger finger and tendonitis. Historically, many of my patients with the aforementioned conditions will be law enforcement officers, firefighters and office workers. In the past few years however, I have seen a vast amount of teenagers and young adults who are suffering from repetitive stress injuries to their hand, wrist and thumbs. Gaming in itself is a wonderful activity; it provides individuals with the opportunity to connect and compete with friends and to express themselves through a diversified spectrum of gaming genres. Gaming however, like any physical activity, can put repetitive stress on the bodily components that it utilizes. Unfortunately, this stress can lead to debilitating injuries and conditions that can limit and at times, completely prevent gaming activities. As both an orthopedic surgeon and fan of Nintendo gaming, I want to do all I can to ensure you can safely and effectively game without pain. There are a variety of specific exercises and stretches, which will assist in preventing hand, wrist and thumb pain while utilizing the Nintendo Wii controller. These exercises may increase hand, wrist and thumb dexterity, which will in turn potentially increase your actions per minute and reduce the likelihood of suffering a repetitive stress injury. As a hand surgeon, I extend care and treatment to gamers of all levels who have sustained injuries ranging from acute and chronic wrist and thumb pain to severe Carpal Tunnel Syndrome, DeQuervains tenosynovitis, and tendonitis. 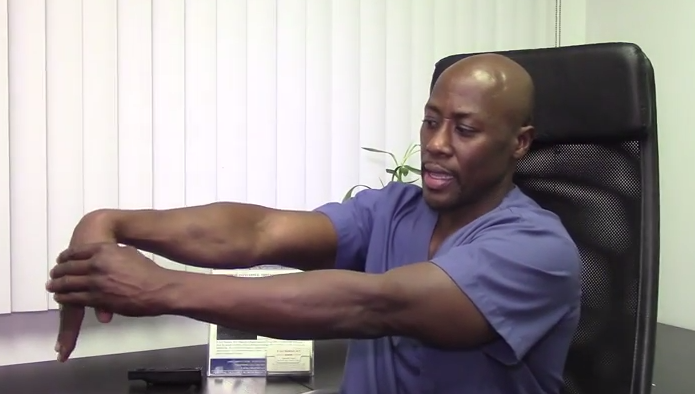 All in all, significant wrist and hand pain are the most common issues that I treat. Many of these health issues have a high potential of being prevented if several basic fundamental exercise and stretches are properly done before, after and during gaming sessions. These techniques, which I have developed, may not only improve your actions per minute, but they may also decrease your risk for injury, hence, allowing you to enjoy your favorite Nintendo games on a regular basis. As is often said, taking preventative measures is essential, as recovery from the aforementioned conditions can be long and difficult to deal with both physically and emotionally. Listed below are my top 10 stretches and exercises that will assist you in preventing hand, wrist and thumb pain while using the Nintendo Wii controller. The following exercises will also be demonstrated in the attached video. 1. Place your hands and wrists in warm water for approximately 2 minutes before you begin a gaming session. While your hands are submerged abduct and adduct your fingers and flex and extend your wrists. 2. Open and close your fists for 15 seconds for each hand. 4. Do the Rolling Piano Key exercise for 15 seconds on each hand. This involves using the thumb to tap the palmar (volar) surface of each digit twice, then to do the same to the back of each finger. 5. Take a 1 or 2 minute break after every 60-90 minutes of gaming to gently shake out your hands and wrists. 6. Perform circle and reverse circle exercises with the thumbs facing each other for 15 seconds. 7. Perform the Talking Parrot or Table Tope flexion and extension exercises. This involves flexion and extension of all digits at the MCP (metacarpal-phalangeal) joints for a set of 10 repetitions for 15 seconds. 8. Make circles and reverse circles with your wrists. For each wrist, perform a circular movement for 10 repetitions in each direction. 9. Do the classic Nirschl exercises for your extensor tendons. Stretch for 30 seconds on each side. 10. Next, perform the “Windshield Wiper exercises”. Firstly, place your forearms on your thighs with your palms facing down. Once in position, move your wrists from right to left and reverse. Lastly, I would also recommend using the non-dominant hand once or twice per week to improve the dexterity and strength in that extremity. This may seem impossible initially but you will improve each week if you are consistent. Thank you so much for this and your other hand and wrist posts. I truly hope this will help me as I’ve been having a lot of pain lately and have been limited so much in what I can do in life, not only playing games but playing musical instruments or really any basic activities that use my hands. Thank you for your site.